Four traditional detached village houses set in the Test Valley enjoying open countryside views. A traditional English village is high on many people's list of ideal places to live. And where could be more perfect than Goodworth Clatford. Nestling in the Test Valley and surrounded by rolling countryside and farmland, other pretty villages lie nearby, each with their own distinctive character, and together they provide a thriving community based around village schools, churches, local shops, popular pubs, and sports and social activities in village halls and recreation areas. Add to the mix the bustling town of Andover, less than three miles away, which provides all day-to-day shops and amenities together with good communication links, and this quiet village location has even stronger appeal. Stockbridge, a traditional market town, is also within easy reach with its attractive, broad high street where individual shops, galleries, boutiques and restaurants are interspersed with places to stop for coffee or a cool drink by the river on a summer’s day. Hazeley Developments' traditionally styled homes have all the advantages of modern building technology, which results in a comfortable living environment, easy maintenance and economical running costs. 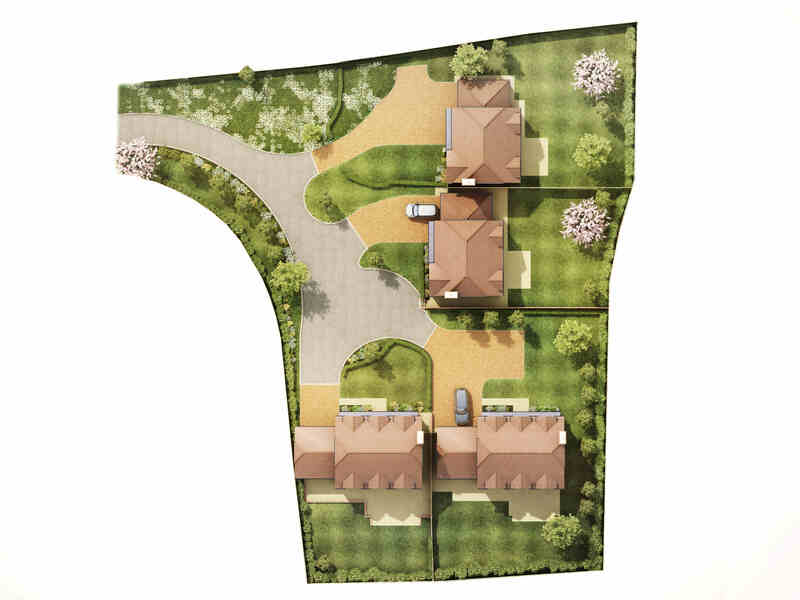 These four detached houses are tucked away off Barrow Hill in a secluded setting and each sits in a generous garden designed to encourage residents outside to enjoy the sense of space and views over open fields. The buildings celebrate traditional materials and the red brick elevations have detailed tile hanging, plain tiles to the principal roof and slate roof over the porch and bay windows. Stone window sills add further substance to the design. Great amenities on your doorstep or a short drive away. Local amenities are excellent with a primary school, 13th century church, a shop with Post Office, a choice of pubs with The Royal Oak and The Clatford Arms, a garage, a recreation ground and several sports clubs. Andover is easily accessed from here, being less than three miles to the north and is a market town dating back to Saxon times with a well established community and a wide range of shops and amenities and a popular street market on Thursday and Saturday in the high street. Stockbridge is just over 5 miles to the south and has an attractive broad high street at the centre of what is one of the smallest towns in the country. With a fascinating history through the centuries, Stockbridge has two former Iron Age hillforts nearby and there is recorded evidence of a settlement in the valley dating back to the 12th century. Today it is a bustling and attractive place where traditions thrive alongside modern conveniences. Great connections, at home and away. This is an area renowned for its rolling landscape with belts of woodland, open farmland, chalk streams and water meadows. But far from being remote, there is a variety of local villages, towns and cities within easy distances which provide a host of shops, amenities and leisure activities as well as excellent train links. Families are drawn to the area due to the good schools locally including the Church of England aided primary school in the village for children aged 4 to 11 which has been accredited an Outstanding rating by Ofsted. Independent schools in the area include Farleigh, a preparatory day and boarding school for 3 to 13 year olds and Rookwood, a non-selective day and boarding school for children aged 2 to 16. Andover Academy has a dedicated sixth form and there is also Peter Symonds College in Winchester. The A303 replaced the A30, which still runs through Stockbridge and carries traffic from London to Dorset and the West Country. The A34 runs nearby and connects Winchester with Oxford. There are also good connections with the M3 and M4. Four bedroom show house, which will be sold with all flooring, curtains and light fittings. Traditional four bedroom detached house with stunning kitchen, dining & living space. Get in touchIf you have seen a development or property that interests you, feel free to get in touch with our Sales Manager, Delia Edwards on 01962 764515 or 07880 511 685. She’ll be glad to help you with any questions you may have.